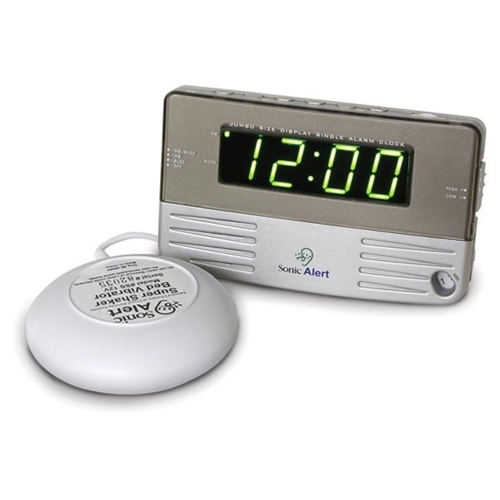 Sonic Boom Alarm Clock SB200SS from HealthyKin.com is a great bedside alarm clock as well as an easy travel clock. Basic function is our unique extra-loud alarm for sleep / wake confidence, a large display and our bed vibrating unit in case you need a little 'shaking for the waking'. This is a great alarm clock! I love all of the options available: alarm clock sound, alarm clock volume, alarm clock sound off/on, vibration on/off! I purchased the alarm clock because I am losing hearing in my right ear and I was sleeping through my alarm clock in the mornings. I am not a morning person and I actually like being woke up by the "Super Shaker" rather than sound! I put the shaker under my mattress and it works great! Also, the battery back up was important to me because we have power surges all the time in our neighborhood and the clocks go out. I don't have to worry about resetting this clock every time because of the battery!